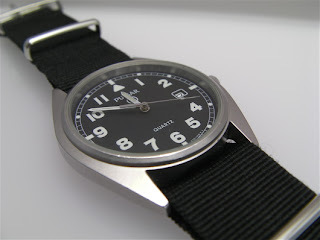 I was looking for this watch to 'complete' my British issued quartz G10 watch collection. I found some but had problem getting it as the website selling it did not respond to my email. Anyway as chance would have it, 1 came up on a popular military forum and I got it. 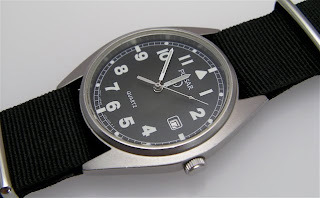 According to the seller, this watch has seen action and I can attest to that as there are lots of 'wabi' on the watch. 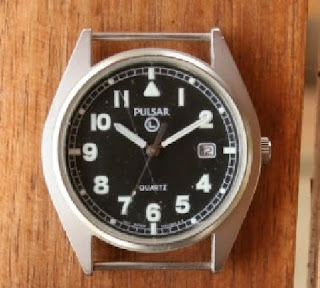 Pulsar won the military contract to provide watches to the MOD in 2001 (?). However, this was a short lived contract as the Pulsar had problems. More about this later. 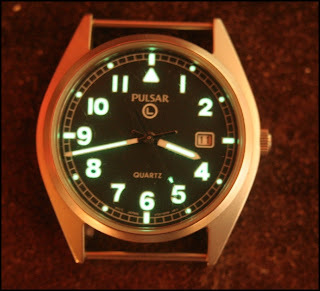 The Pulsar gain some popularity recently when it was spotted being worn by a British royalty while in action. The case is made of stainless steel. It has a matte (bead blasted) finish. The finish is fair and the case is well made. The case measures 36.5 mm in diameter. The lug to lug is 41.5 mm and the lug width is 20 mm. It is very thin at 7.5 mm. The case is made of 2 parts. The main body with the crystal and the case back. The case itself is wider as compared to the 'bezel'. The bezel measures 33 mm in diameter. 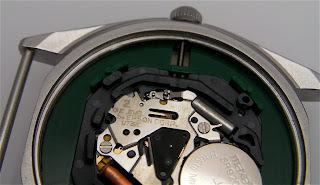 The lugs are straight but it does not affect the wear comfort of the watch. 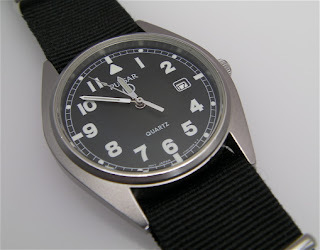 The watch has fixed bars which is common for military issued watches. The case has a 'flat' portion between the lugs. This is to allow a better fit when using leather or rubber straps. The 'flat' spot prevents the strap from rubbing the case and damaging the strap. This is because of the short lugs. The crown is at the 3 o'clock position. 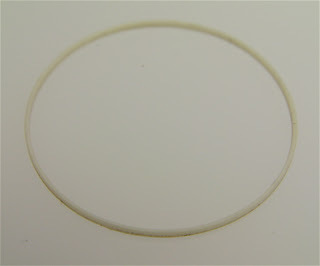 It measures 4 mm in diameter and 2.5 mm thick. It is very easy to use as the crown is large. The crown is polished and it is unsigned. 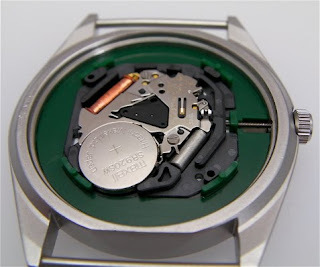 According to reports, the crown is one of the problems related to the watch and caused its eventual withdrawal from service. The crown is known to fall off. The crown has three positions, 'in' for normal use, position 1 (pulled out) for quick date adjustment and position 2 (pulled out further) for time adjustment. There is a little gap on the back between the case and the crown to assist in pulling out the crown. The case back is of the snap back case design. The case back has the same finish as the case. The case back is made in Hong Kong (?) by Seiko Epson. The case back can be open from 12 and 6 o'clock position as there are 2 notches to open the case back. Note the notch at the 6 o'clock position to pry open the case back. 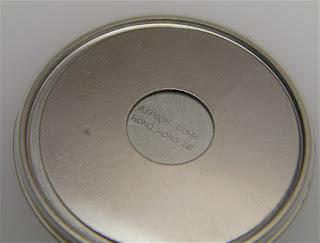 The markings on the case back includes the NSN 6645-99-605-2627, the broad-arrow and the issue number/ date. 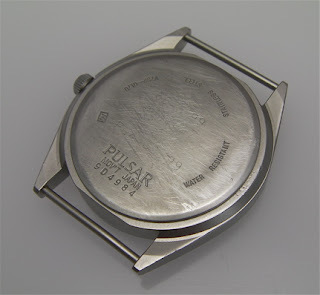 This watch was issued in 1999 which is strange as Pulsar suppose to have won the contract in 2001. Emmmm..... These are the military markings. 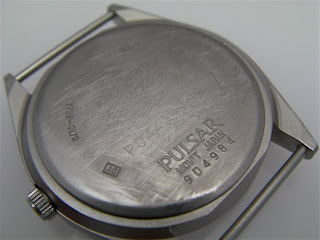 Around it we find the 'Pulsar' signature, the watch serial number, movement number, stainless steel and water resistant. The unique aspect of the case back is that there are many different case back markings. I have seen those without the Pulsar serial number, case backs where the markings are different locations, polished case back and a host of other differences. As can be seen from the photographs, someone had tried to remove the military markings. 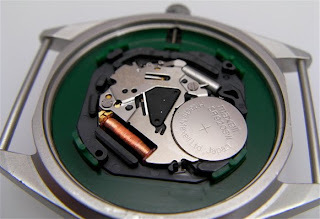 Instead of the typical rubber gasket, this watch is fitted with a silicon (?) or Teflon (?) gasket. This makes removal and installing the case back very easy. As such, I suspect that the water resistance rating of this watch could be poor. 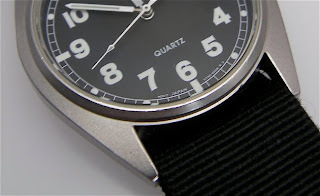 The V732 (as is the 7N32) is a basic 3 hand movement with a calendar complication. The second hand is centrally mounted. Both movement have 1 jewel. Another view of the movement. Note the green movement holder. It anchors the movement by holding it at the 4 corners. The dial is matte black. I like matte black dials. It has the railroad track minute marker. The hours are marked with Arabic numerals except for the 12 o'clock marker which has the traditional triangle and at 3 o'clock due to the date window. The dial is uncluttered and I like it. It makes reading the time easy. The dial is signed 'Pulsar' just below the 12 o'clock triangle. Below the 'Pulsar' sign, we find the 'L' inside a circle. This indicates the type of luminous material used. In this case it is Luminova. Just above the 6 o'clock marker we find the legend 'Quartz' and in small print below the 6 o'clock marker, we have 'Movt Japan' and the movement used 'V732-OZOB R2'. It is interesting to note that the size of the font gets larger as it gets closer to 6 o'clock position and gets smaller as its moves away from that position. The date is displayed via a cut-out at the 3 o'clock position. There is a white outline around the cut-out to enhance the window. The date is black numbers on white back ground. It would be nicer if it was the other way around. The luminosity of this watch is just awesome. All the numbers are luminous as are the the hours dots and the rectangles at 3, 6 and 9 o'clock positions. The hands are of the needle design. The hands are white coated. This I guess is to reduce the reflection if it was polished stainless steel. The sweep second hand however is polished stainless steel. All the hands are luminous (refer photograph above). The minute hand looks newer as compared to the hour hand. I suspect the minute hand could have been replaced some time in the watch life. The only complain I have about the hands is that it would be nice if the minute hand actually reaches the beautiful railroad track minute marker. The crystal that is suppose to be fitted to this watch is acrylic crystal. However I suspect that the crystal that came with this watch when I got it was mineral. From my readings, some of the later watches were issued with mineral glass. I wanted to keep the crystal original to the watch, but I found out that there was a chip on the crystal that allowed water to ingress the watch. As such, I had the crystal replaced. 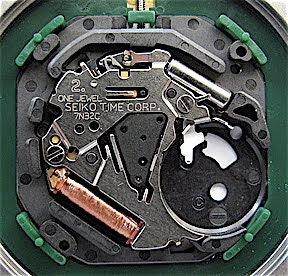 The new crystal is hardlex crystal from Seiko. There is no AR coating on the new crystal as is with the original. The watch with the original crystal. Note the scratches on the crystal. The chip is at the 2 o'clock position. I hope that with the change of the crystal, it will at least solve one of the problems that is associated with this watch. The problem being that the crystal is known to pop off from the watch. The watch came with a black NATO type strap that has seen better days. I kept the strap to the watch. Had it washed and now looks better. I suspect it has also been trimmed down to shorten the length to a manageable length. I like the watch. 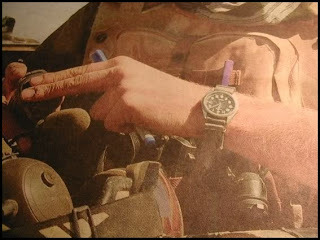 It is an easy watch to read the time off, well as is most military watches. It is thin/ slim and it is comfortable when worn. It's size and weight makes it a comfortable wear and most of the time I even forget that it is there. So far (touch wood) I have not had the problems that this watch is famous for. Fitted with a leather strap, the watch would not look out of place in civilian life. Thanks for the info. Having bought a really nice copy on ebay recently (many thx Allan) I must say I really like the Pulsar. It seems to be more contemporary looking that other types. And the Pulsar branding is more subtle that others too. Welcome to the blog. Thank you for the information on the hands. I hope you enjoy your watch. I like mine. "I suspect the minute hand could have been replaced some time in the watch life." I have the same model and the hands are also diferent. Welcome to the blog. If you read my later post on the Pulsar, I suspect that both hands were correct, long or short is model and year issued dependent. But I could be wrong. I have 3 Pulsars and I have both hands. Welcome to the blog. Thanks for the information.